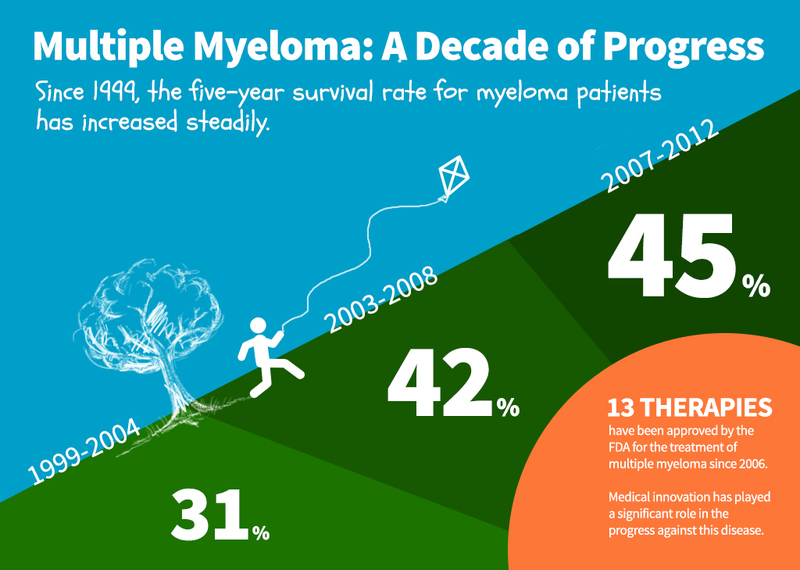 As Multiple Myeloma Awareness Month comes around again, the myeloma community has good reason to celebrate the past decade, which has brought new treatment options for today and a better understanding of how to treat this disease in the future. A patient who is diagnosed with myeloma has an about 47 percent chance of living five years or longer, which is up from 31 percent twelve years earlier. Meanwhile, although people are being diagnosed with myeloma at an increasing rate each year, their survival chances are improving. Between 2006 and 2015, the U.S. Food and Drug Administration approved 13 new therapies for the treatment of myeloma, which is especially remarkable considering myeloma accounts for less than 2 percent of new cancer cases in the United States each year. During the same period, the FDA approved 20 treatments for lung cancer, which accounts for 13 percent of all new cancer cases, and 12 for breast cancer, which accounts for 12 percent. These new myeloma therapies have already helped patients live longer lives, and the best may be yet to come as doctors explore how to use them most effectively. According to data released during the 2015 Annual Meeting of the American Society of Clinical Oncology (ASCO), researchers believe that by 2022 at least half of myeloma patients will live 6 years after being diagnosed, which is 140 percent longer than was expected in 2001. Over the past decade, researchers have improved our understanding of the immune system’s role in myeloma, which may transform the way we treat this cancer in the future. For instance, one study of 74 myeloma patients who live for 10 years or longer found that their immune systems may be better equipped to recognize and attack harmful entities—such as cancer cells—than others. While immunotherapies are certainly exciting because of their new approaches, we should not underestimate the therapies approved over the past decade. Over the next decade, immunotherapies, which leverage our body’s immune system to bring cancer under control, may help further extend the lives of myeloma patients. These approaches include antibody-based therapies, chimeric antigen receptor (CAR) T-cells and checkpoint inhibitors. To learn more about how myeloma treatments are allowing patients to continue living active lifestyles, read our “Patients Not Letting Myeloma Hold Them Back” story.